Mass Effect 3 really is getting multiplayer, but don't worry, it's entirely optional. After lots of rumors and speculation - a lot of which turned out to be true - BioWare has confirmed that Mass Effect 3 will contain co-op multiplayer gameplay as well as the usual fighting of ancient robots and their minions in the single player campaign. 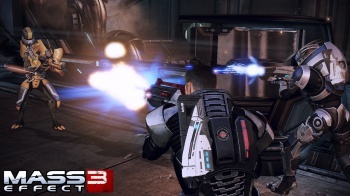 Writing on the BioWare forums, community manager Chris Priestly said that Mass Effect 3's co-op mission would run parallel to the main story and allow up to four friends to fight together to liberate territory from the clutches of the enemy. Players will be able to create a co-op character from a variety of classes and races, including Turians, Asari, and Krogans. These efforts will have a direct impact on the player's "Galactic Readiness" meter, which shows how well-prepared the Galaxy is to fend off the Reaper assault. Thus, success in the co-op mode will also provide players with an alternative way of getting a perfect ending in the single player game. BioWare is also rolling out the Mass Effect: Galaxy at War system, which Mass Effect 3's co-op is just one part of, along with other, as-yet-undisclosed, elements. Players will be able to impact their Galactic Readiness in a number of ways through Galaxy at War, with other "platforms and interfaces" to be announced in the coming months. Priestly also made it clear that the development of the multiplayer had not had an adverse effect on the single player mode, as BioWare's new Montreal studio had been brought in to help ensure the game was as good as it should be. "Both studios work together as partners, lead by the core Mass Effect team, unified in a single vision," Priestly explained. "Under the direction of Casey Hudson and other team veterans, both studios make contributions to both the single player and multiplayer modes in Mass Effect 3." "Rest assured that no compromises were made to either of these modes in the development of Mass Effect 3," he added. Understandably, the reaction to the news has been rather mixed, with some loving the idea of the idea of Mass Effect multiplayer, others hating it, and plenty more falling somewhere in between. Personally, I'm cautiously optimistic; my main concern was that multiplayer would detract from the single player game, but it looks like BioWare was way ahead of me. With that concern out of the way, it's a lot easier to appreciate the multiplayer for what it is: an optional part of the game that sounds like it could be fun.